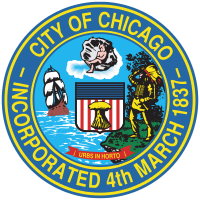 List of alderman, office address, phone number, and website for all 50 Chicago wards. Ward office locations for aldermen. The data can be viewed on the Chicago Data Portal with a web browser. However, to view or use the files outside of a web browser, you will need to use compression software and special GIS software, such as ESRI ArcGIS (shapefile) or Google Earth (KML or KMZ). OUTDATED. See the current data at https://data.cityofchicago.org/d/fwns-qqic -- To view or use these files, compression software and special GIS software, such as ESRI ArcGIS, is required. To download, right-click the "Download" link above and choose "Save link as." This version of the data was posted 8/8/2012 and stayed live until 7/16/2015, when it was replaced with the list of aldermen inaugurated 5/18/2015, after allowing time for most office space arrangements to be finalized. Ward precincts, which function as local election districts, in Chicago. To view or use these files, compression software and special GIS software, such as ESRI ArcGIS, is required. To download, right-click the "Download" link above and choose "Save link as." List of organizations currently receiving reduced water rates by premise. Data Owner: Water Management. Time Period: Data current as of May 2012. Update Frequency: Data is updated as needed. Waterways in Chicago. To view or use these files, compression software and special GIS software, such as ESRI ArcGIS, is required. Waterways in Chicago, including Lake Michigan, rivers, and lakes. The data can be viewed on the Chicago Data Portal with a web browser. To view or use the files outside of a web browser, you will need to use compression software and special GIS software, such as ESRI ArcGIS (shapefile) or Google Earth (KML or KMZ), is required. KML file of water features in Chicago. To view or use these files, special GIS software, such as Google Earth, is required. List of locations and test results for pools of mosquitoes tested through the Chicago Department of Public Health Environmental Health program. The Chicago Department of Public Health maintains an environmental surveillance program for West Nile Virus (WNV). This program includes the collection of mosquitoes from traps located throughout the city; the identification and sorting of mosquitoes collected from these traps; and the testing of specific species of mosquitoes for WNV. No parking is allowed on many major city streets from 3 a.m. to 7 a.m. between December 1st and April 1st. To view or use these shapefiles, compression software and special GIS software, such as ESRI ArcGIS, is required. To download this file, right-click the "Download" link above and choose "Save link as."